Are you looking for a college success resource that speaks to the all aspects of a student’s college experience? 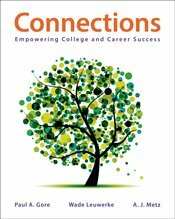 Connections is an innovative new text that offers the ideal balance of motivation, academics, and life skills. It starts with comprehensive coverage of the topics typically covered in the introductory course but has a unique emphasis on goal-setting, life skills and career planning. When packaged with LaunchPad for Connections, it integrates a state-of-the-art, norm-referenced, student-self assessment of non-cognitive and cognitive skills tool called ACES. Print and digital are uniquely combined for a personalized experience. In every chapter, students are encouraged to take a positive, success-oriented approach to this course – and to life in general – by working to strengthen their strengths, celebrate progress, and use setbacks as opportunities for growth. With an emphasis on self-knowledge, and on building skills for college and career success, Connections empowers students to become self-regulated, collaborative learners – learners who thrive in school, on the job, and in the community.